I was inspired by Bloc Party to finally join (and host!) my first quilting bee! I’m so excited about this group. There are 12 of us who will be creating Modern-inspired quilts (however each of us interprets that). I can’t wait for my month to come. I’m planning to have mostly solid fabrics (bright!) with one or two print per block. The main “star” of the block will be the added element of TEXTURE!!! I want to play around with smocking (think my Honeycomb pillow, but mixed in with a block), pleating, gathering, all sorts of textural elements. Anyways, more about our group. I started a new blog for us, so we can post often to tell each other what we’ve been up to. Add us to your reader! : http://modquilting.blogspot.com. Lastly, I’ll leave you with this mosiac I put together from my talented group of Mod Quilters! P.S. Have you all checked out Hawthorne Threads? It’s a new online fabric store that I’m super excited about! Ok, so here’s the bee-down (get it, low-down, but instead bee-down? ): 12 members, 12 months. Each member is assigned a month. When your month comes around, you pick out fabric for a quilt top, divide it into 12 pieces (however you see fit to do so, most people recommend sending approximately the equivalent of 1.5 fat quarters per person) and then mail them out to the other 11 members of the group (keep one pile for yourself). You then give guidance to the members as to what kind of blocks you are looking for (do you want to make a string quilt, a log cabin, a cathedral quilt, are their block size requirements or do you want it to be random, can they use any of their own stash fabrics or do you want them to only use the fabric you sent, etc) and everyone makes you a block (or as many blocks as they can from your fabric/requirements) and ships it back to you. At the end of your month you’ll have enough blocks to make a quilt and at the end of the bee you will have 12 finished/collaborated quilts! It’s also just a great way to get to know other quilters and to partake in something fun and memorable! Thanks for sharing the news about Hawthorne Threads!! Looks like a great place to shop! oooh! there’s my November Blocks! 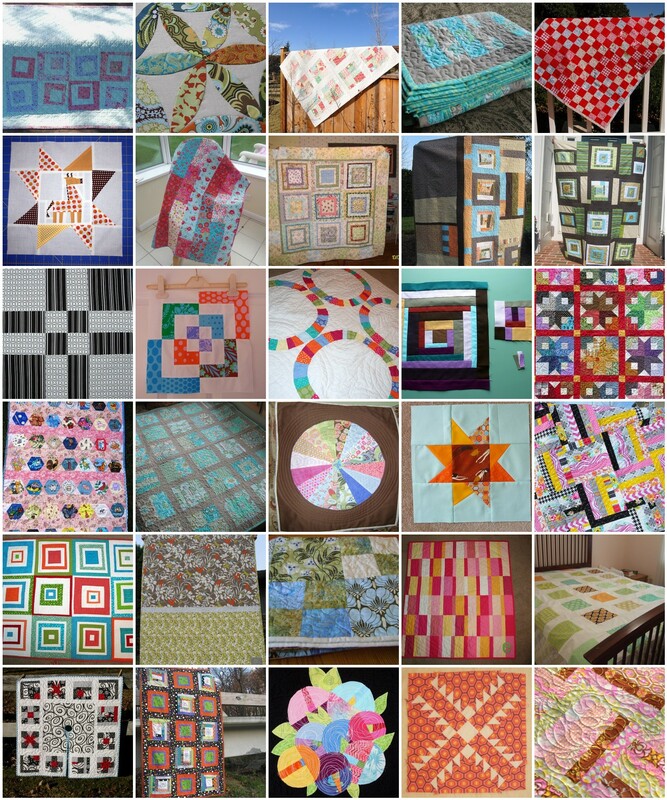 I just finished that quilt… go check it out at the Bee Balm blogspot… fun stuff!